Happy Father's Day: Lonny Albertson built a beautiful fire pit in the backyard of his Eagan home. 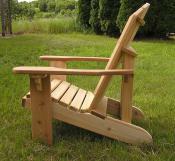 So Tammy Albertson ordered three standard cedar Adirondack chairs for her husband. Tammy plans to leave the chairs unstained so they'll naturally age to a handsome silver-grey. Optional cup holders can be placed on either or both arms. Western Red Cedar has magical properties. It is lightweight. On hot days, it is cool to sit in. It resists bacteria and fungi, ensuring long life. Most importantly, it is 80% the strength of Oak, and is perfect for outdoor furniture. 30" wide x 36" deep x 38" high. Arms 21" high. Price: $199.00 unstained, $240 stained. Check out our optional cup and wine glass holders. They're only $5 each.